I consider inbound marketing to be the true champion of digital marketing. But for many businesses it can be plain overwhelming. If you are new to inbound marketing, here are a few high-level resources that will quickly bring you up to speed. HubSpot has compiled a huge library of e-books around inbound marketing. Subjects range from re-targeting to content marketing to on-page SEO. It is, in a word, monstrous. The library also includes publications from well-known entrepreneurs and business types. Names like Guy Kawasaki, Peg Fitzpatrick and Noah Kagan of AppSumo bolster this already impressive array of resources. Take some, or a lot of time to go through this goldmine. It’s well worth it. If you’ve tinkered in the inbound marketing world, you would know the name Neil Patel. Neil is a successful marketer who runs Quick Sprout and its internal blog. He has a knack for getting anyone who reads his material, well and truly fired up. His clients include Amazon, IBM, NBC and General Motors. Needless to say, he is up-to-date on the world of inbound marketing. He has also compiled some detailed guides on how to succeed at some of the main aspects of the game. The Quick Sprout Blog Guides contain titles like “The Beginners Guide to Online Marketing” and “The Complete Guide to Building Your Blog Audience”. They cover everything you’ll need to be successful in this world. There’s even a guide on personal branding. Like HubSpot’s library, these guides are dense. They will take some time to get through but again, they’re well worth it. Moz started in 2004 as an SEO consulting company. They’ve since branched out into broader forms of inbound and content marketing. They offer services and advice on everything from SEO Best Practices to Social Media Marketing. They’ve created a traffic-centric library that contains how-to guides that every marketer should investigate. Start with “The Beginner’s Guide to SEO” and work your way from top to bottom. You’ll notice the e-books have a strong SEO presence. They offer a cheat sheet for web developers and an entire list of Google Algorithm updates. Handy resources for the technical marketer among us. Contentmarketinginstitute.com provides content marketers with well-structured guides on, you guessed it, content marketing. They run a blog dedicated to the topic, which big names in the marketing world contribute to. CMI also offer content marketing training, events, and a massive resource library. There is even a podcast and a magazine. What distinguishes effective content marketers from their less effective peers? What tactics are content marketers using most often? Which are they finding to be the most effective? What social media distribution channels are marketers using? Do they believe they are effective? On average, what percentage of the organisation’s marketing budget is being spent on content marketing? What are the biggest challenges most marketers are facing? The data is a priceless insight into actual workings of companies and their inbound marketing campaigns. Real life evidence of what worked, and what didn’t. The sheer amount of quality on offer makes CMI a mandatory stop on your journey to proficient content marketing. The world’s largest online social media magazine has compiled a handy set of guides to kickstart your social media campaigns. Though it’s not a pure inbound resource, SME provides valuable tips on how to syndicate your message across social media. In their getting started section, they provide a report on how much time you should be spending on your social media efforts, as well as the benefits and the drawbacks of social media. There is a well-organised library of guides on the major social platforms along with sections on blogging, video, visual content, and podcasting. Ok, Great! Where do I Start? 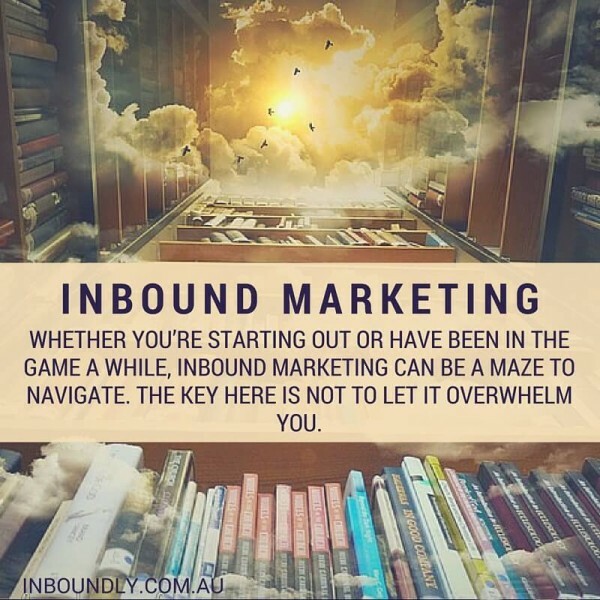 Whether you’re starting out or have been in the game a while, inbound marketing can be a maze to navigate. The key here is not to let it overwhelm you. Even the five resources above will be a lot to take on at first. Discover what is right for your business and selectively implement. Not every marketing automation tool, social media platform and inbound strategy or blog is for you. Test and re-iterate what is getting you results – and focus down rather than have a finger in all pies.